Where did sparkles come from? Why do we use Sparkles? “Sparkle” is the collection of graphics that have been developed to visually reference and evoke the Sprout Values graphics. They can potentially be used across project types: webpages, sell sheets, webinars, display ads, etc. 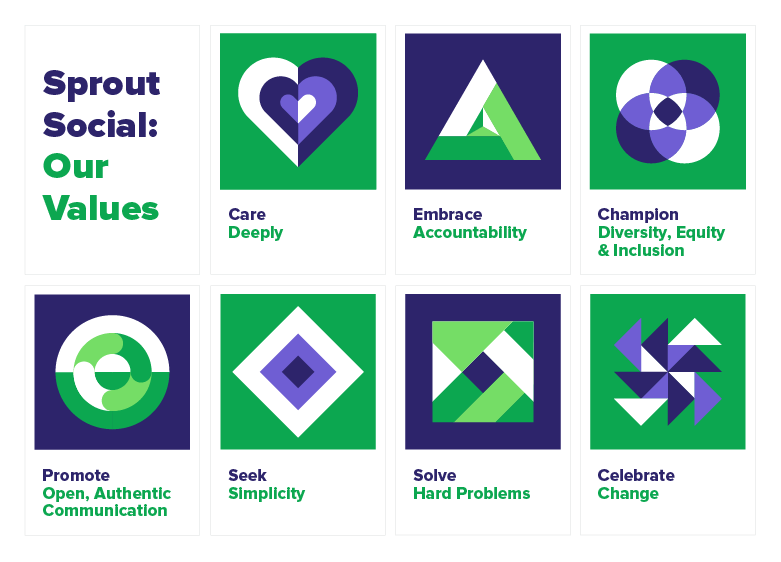 With the launch of our Sprout Values in mid-2018, we created a suite of abstract, geometric graphics to visually represent each value. These graphics have very specific meaning and as a result we don’t alter them. Sparkles were created to visually reference the Sprout Values graphics (and by extension, the values themselves). But by further abstracting and simplifying them, it allows the flexibility for these graphics to be used as a motif throughout our properties to show our brand story. Sparkles were created to visually reference the Sprout Values graphics (and by extension, the values themselves). By further abstracting and simplifying them, it allows the flexibility for these graphics to be used as a motif throughout our branded materials. Sparkles generally serve two purposes: one conceptual, one functional. Conceptual: use them to show that our values are woven into everything we do. Functional: use them to guide the user through the design or provide a visual break within a content-heavy design. However, this does not mean that we need to use sparkles on everything. A sparkle must be visually recognizable as a derivative version of a specific Sprout value graphic. These are examples of sparkle that are clearly drawn from the Sprout values graphics without just duplicating the values graphic wholesale. 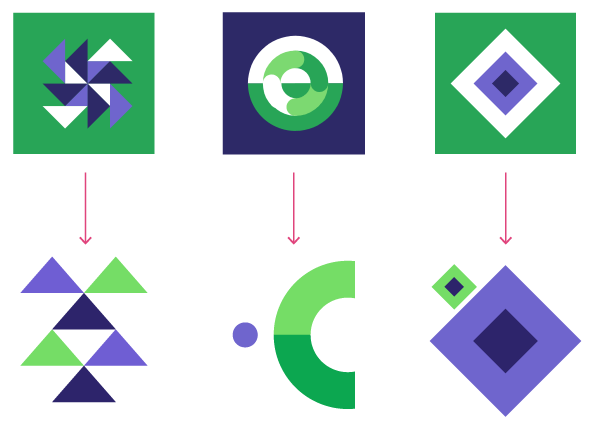 Each sparkle uses the one basic shape type—circle, triangle or rectangle—from the Sprout Value it is referencing. Do not combine multiple types of shapes. Sparkles are used intentionally and with restraint. They are not decoration and overuse will cheapen their significance. Seek simplicity. When choosing which sparkle to use, consider which of these themes the copy or context is speaking to. Use a circle motif if the themes are around community, communication, collaboration, integrating multiple perspectives, teamwork, DEI. Use a diamond motif if the themes are around focus, simplicity, solutions, purpose, clarity. Use a triangle motif if the themes are around action, progress, positive change, momentum, energy, celebration. Sometimes one of these themes may not be more prominent than the others, and that’s okay. These are lose guidelines; use your best judgement. Sparkles are a secondary element and should not distract from important information on the page (like a CTA or important graphic). DO: Base your sparkle on a specific Sprout value. DO: Work to use existing visual elements in compelling ways before deciding to add a sparkle. DO: Take the power and responsibility of sparkle usage seriously. DON’T Don’t combine elements from different values or invent things out of thin air. DON’T Don’t use a sparkle to spice up a boring image or product shot. These are the approved colors to use for sparkle. These are pulled directly from the colors used in the Sprout Values graphics, with two lighter tones added for additional flexibility. To be consistent with the style of the Sprout Values graphics, Sparkle should use three colors: two shades of the dominant hue and one shade of the secondary hue. i.e., two purple and one green or two green and one purple. if the sparkle is living ON a color, swap out one of the shades for white.